Fifteen-year-old Sim wants to be a clown. His third set of foster parents think he's as nutty as an Australian fruit cake. So he runs away, joins an outback rodeo, then a travelling circus. 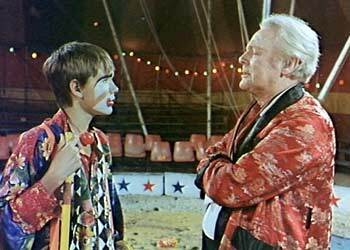 He is taught the art of clowning by a former clown, Anatole, an iron-willed Frenchman who is no longer able to perform. When Anatole returns to Paris, Sim follows, and is finally given the chance to perform at the famous Winter Circus. Based on the David Martin novel, "Clowning Sym".